A great outdoor living space balances functionality and natural beauty, largely through well-designed hardscaping; this includes patios, retaining walls, and rock work. These are the focal point of any outdoor living area, so choose your materials carefully. For over 20 years, the team at Evergreen Landscape Management has been providing superior landscaping services to the Scottsville, NY, area. Here, they offer a guide to help you design your property. If you have a design already in mind, get it on paper so you can refer to it. But, if you're not sure where to begin, hire a professional landscape designer. They will maximize your space and balance practicality with aesthetics. Their detailed plans will also include precise measurements, so you’ll know how much of a material you’ll need to purchase. Concrete: This material is a top choice for pathway and patio designs. To give it a more interesting look, consider staining or texturizing. Brick: Because of the interesting patterns you can create with brick, it makes a great foundation for an outdoor entertaining space. However, it retains moisture easily and can crack in freezing weather. Stone: If you want your pathways or patio to have an organic look, consider stone. With an array of natural colors and textures, you can create a unique look. Natural stone is one of the more costly options for purchasing and installation. Pavers: Because they’re easy to install and typically lower cost than other options, pavers are a popular choice for people who choose not to hire professional landscapers. They work well for borders and patios, and you can choose from many different patterns and colors. To maximize this investment in your home, hire professionals to install your hardscaping. From ensuring the proper permits are in place to making the features safe and secure, they have the expertise to get the job done right. If you’re dreaming of a beautiful outdoor living space, make it a reality by turning to a highly experienced landscaper for hardscaping guidance. 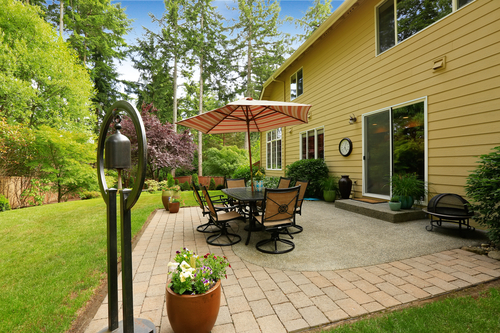 At Evergreen Landscape Management, their team will work with you to design, install, and maintain the perfect outdoor space that you can enjoy for years. To schedule a consultation and free estimate, call (585) 889-9300 or visit their website to find out more.